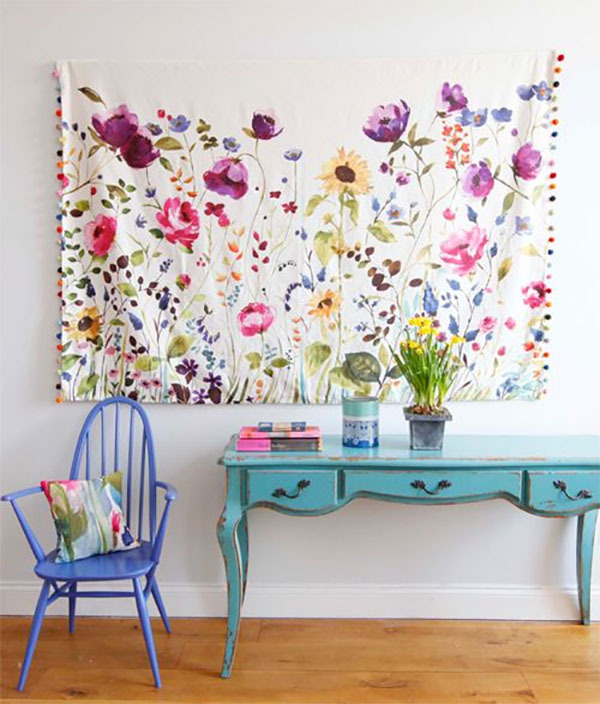 If you own a tapestry that needs hanging, or are planning to buy one, I guarantee you one of these 8 methods will work for displaying your tapestry as lovely wall art. I give you step by step instructions, so this is definitely a post you’ll want to save. Pin this post to Pinterest for later! 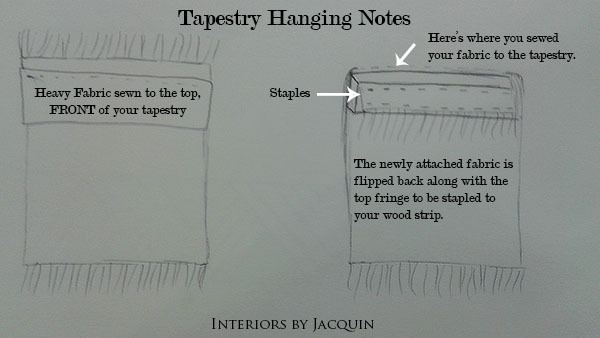 If your tapestry has a casing for a rod, then this may be the hanging method for you. There are a lot of options for rods out there like you’ll find here and here. Casings can really simplify things in that all you have to do is slip the rod in and hang it on nails. If you’d like to add a casing, then simply sew on heavy weight fabric across the back to fit the width of your rod. Sew along the top of your fabric strip and the bottom, leaving the middle open for your rod. (A seamstress may be able to help you with the sewing part.) The casing should be sewn perfectly straight and not necessarily lined up with edge of your tapestry, which could be slightly uneven, causing crooked hanging. 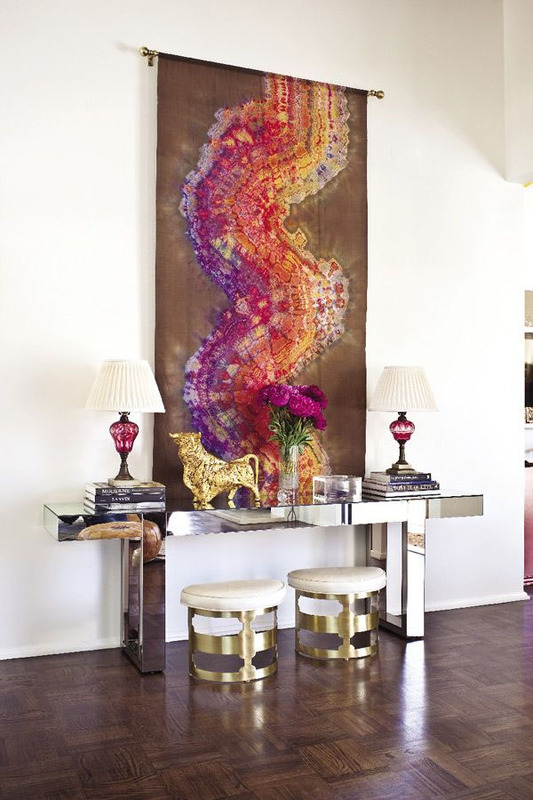 This may be one of the more common ways to display your tapestry or rug, but there are others too! 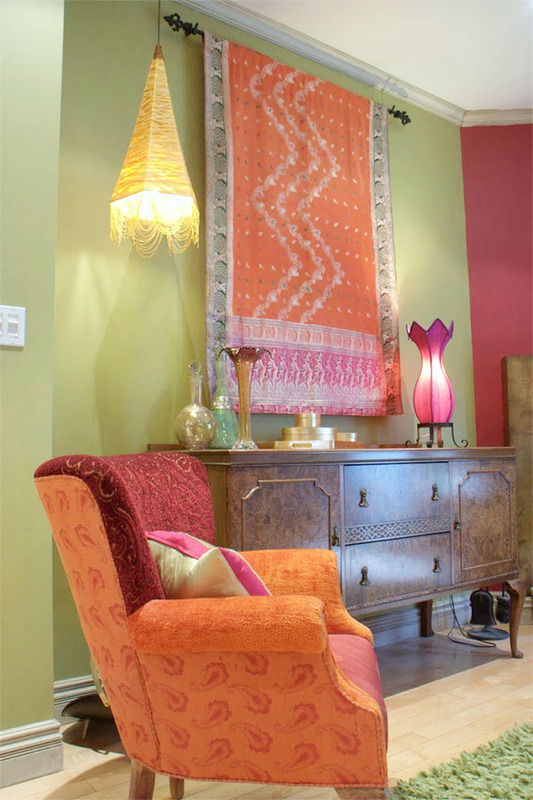 Jane Hall Design featuring an Indian saree turned wall tapestry. 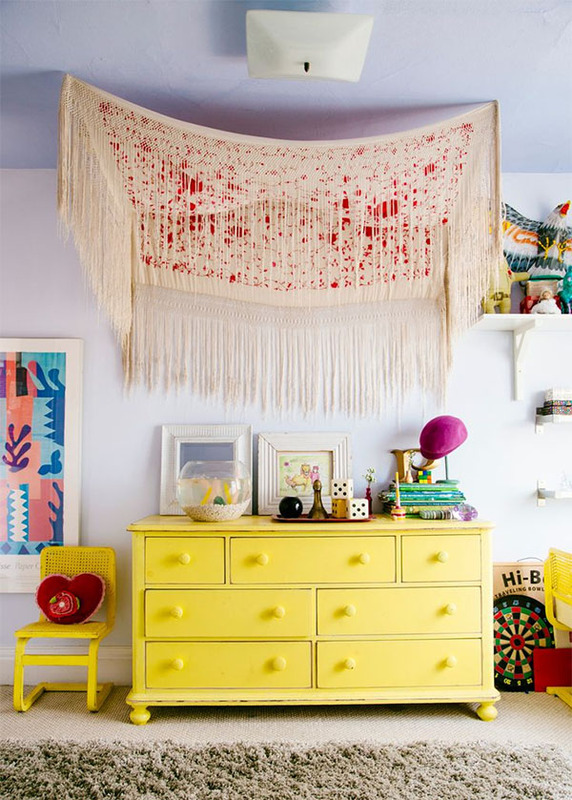 You can nail your tapestry directly to the wall with nails, or even push pins if the tapestry is light enough. This is great for more loosely woven tapestries, as the nails will fit between the wefts. For more tightly woven tapestries or rugs, you would be putting a small holes along the perimeter of your tapestry, but for long term placement and thicker weaves, this may not be a problem. Adhering your tapestry to the wall with velcro is a great method for those wanting to avoid putting any holes in their tapestry. For those with a heavier tapestry, I have a helpful hint to make sure your velcro has staying power. Nail a strip of wood just slightly shorter than the tapestry into wall studs. Adhere the rougher velcro side to your strip of wood on the wall and the opposite velcro piece to the very top of the BACKSIDE of your tapestry, and then connect your velcro. Voila! 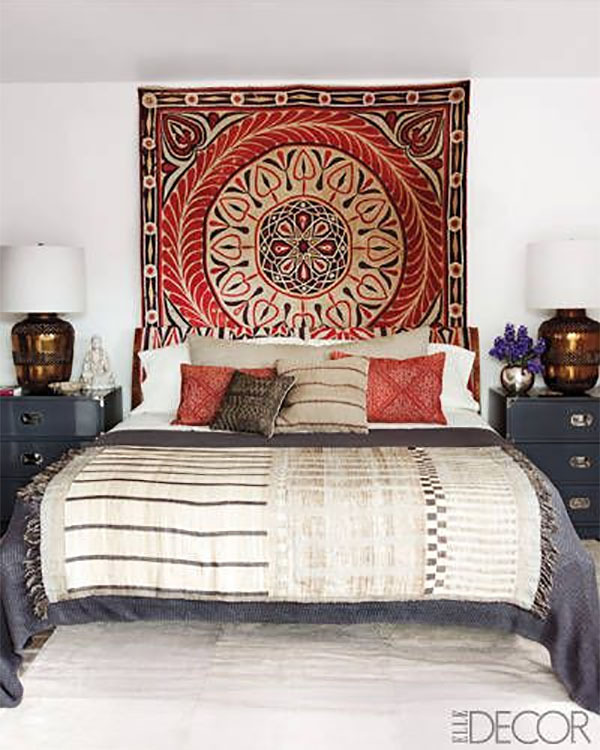 You’ve hung your tapestry without putting a single hole in your prized wall art. Another method that works well for both heavier and thinner tapestries is mounting your tapestry onto a wood frame (like plywood board). If you have a heavy or thick tapestry, you can stretch and staple the tapestry over a plywood board or canvas stretchers and then hang it on your wall with sawtooth picture hangers. The edges of your tapestry will be flipped to the back of the plywood board and stapled down in this method. Foam core mounting is a very similar process to mounting your tapestry onto stretchers/plywood board. You’ll be taking similar steps as in #4, except that you’ll be stapling your heavy linen fabric to foam board instead of wood. You’ll need two sheets of foam board that you will glue together in advance, so be sure that you have enough fabric to cover the edges of your thick foam board. Cover your foam board with heavy weight linen fabric and staple it down (tightly) onto the back of the foam board around the perimeter. Sew your tapestry to the fabric with a curved needle, as explained in #3. 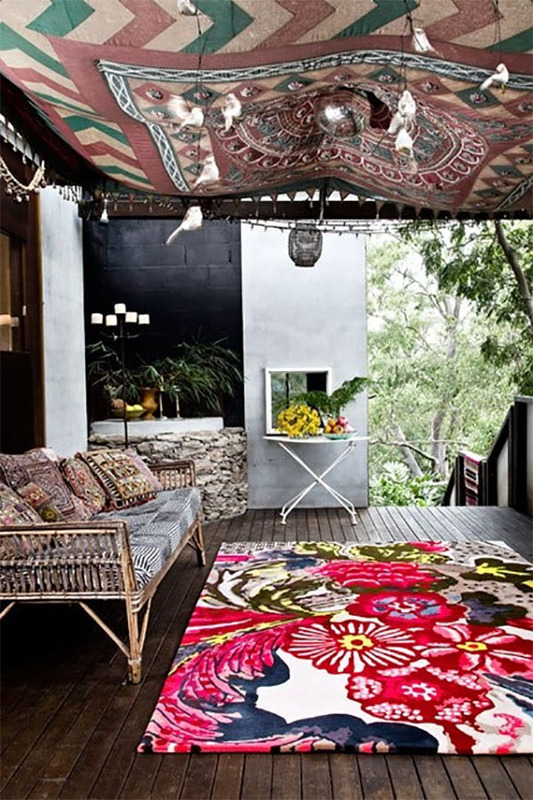 This is a great idea for those wanting to create a more unique ambiance in a space. 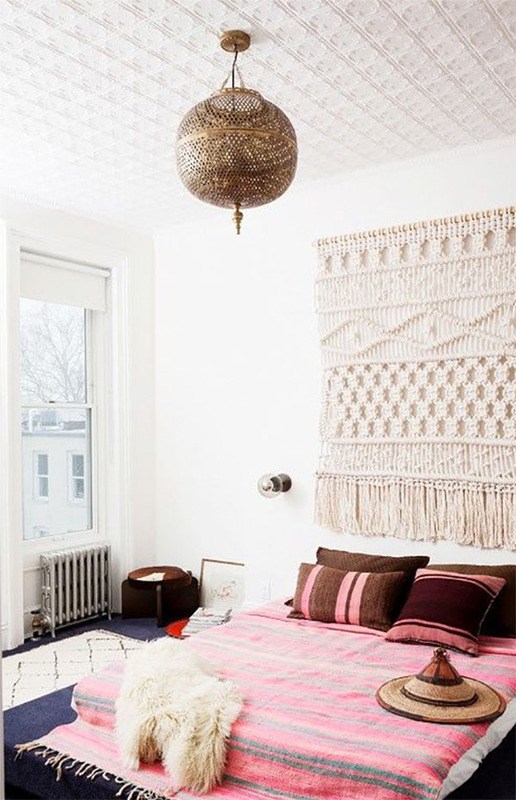 A tapestry hanging from your ceiling can add wonderful drama to your space, along with decorating a rarely decorated element of your home… the ceilings! This method is perfect for tapestries with fringe on both ends. Here’s how it works. Like with the Velcro method in #3, you’ll need to cut a strip of wood that is slightly shorter than your tapestry. For this method, then entire tapestry is NOT attached to a larger plywood board, but rather a narrow strip of wood is attached that only goes along the very top of your tapestry. You’ll need to first add a “facing” to the back, top of your tapestry. A facing is basically a strip of fabric about 6 inches in width and the same length as your tapestry, which is sewn to the FRONT, top of your tapestry, just under the fringe. (You won’t see this fabric or stitching when it’s done because it will be flipped to the back.) This “facing” is flipped to the back and wrapped around your pre-cut wood board. Staple your facing down onto the wood strip in two rows of staples, along the top and bottom of your facing. This will cause your top fringe to be hidden and on the back of your tapestry so that the fringe doesn’t dangle downward over your tapestry. (I’ve included an illustration below to help you conceptualize this.) 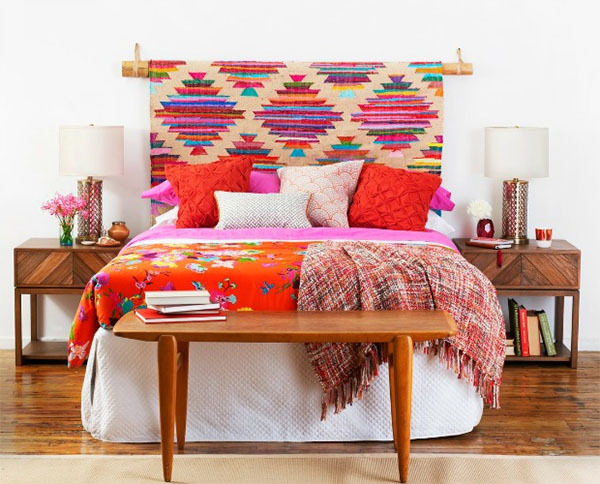 You will hang your tapestry to the wall with nails using the back wood strip now attached to your tapestry. 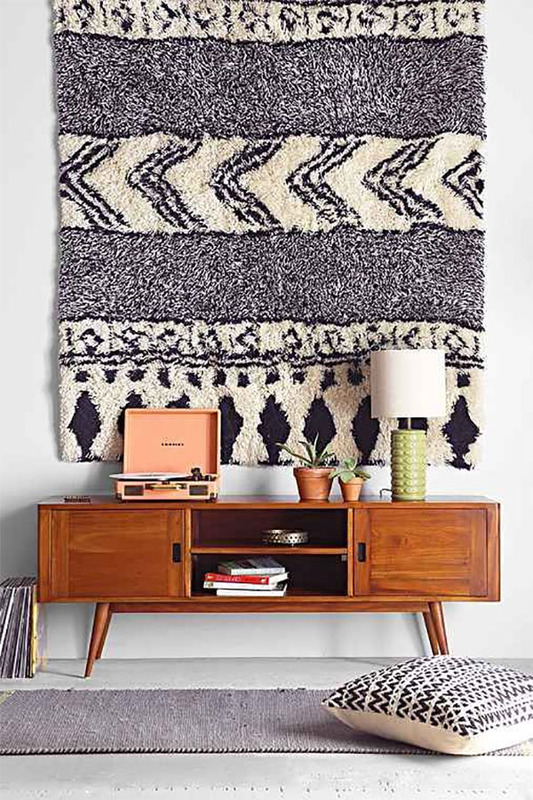 (For a heavier tapestry you’ll want to hang your tapestry in a place you can find a wall stud.) Your fringe across the bottom of your tapestry will hang down from the bottom and look quite nice! 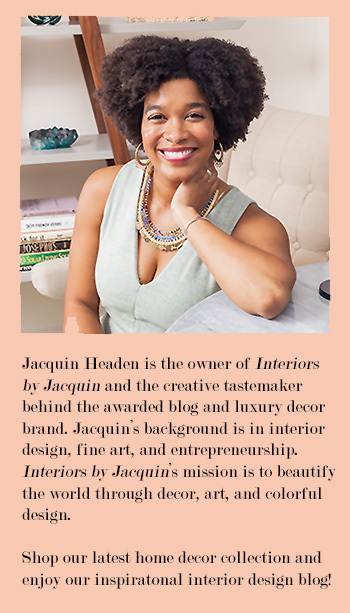 I really love this idea, especially for someone wanting to save a bit of cash by avoiding the more expensive, traditional headboards. 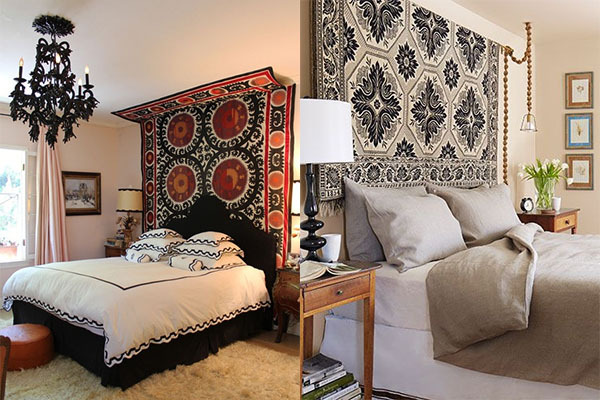 These pictures will definitely inspire you to experiment with hanging tapestries and rugs as bedroom decor.